Collie Temperament – What Made Lassie So Smart? 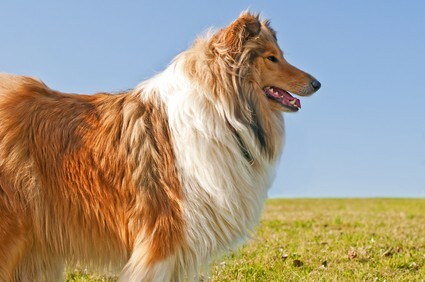 The Collie temperament, highlighted in the movie, “Lassie”, and detailed below, is quite unique and is part of the reason why the Collie is such a great family dog. Before we delve into the Collie temperament, let's take a quick look back at his history. After all, a dog's history often has quite the effect on how his temperament develops over time. Experts believe the Collie originated in Scotland in the late 1800s as a sheepherder. A number of breeds originated from the Collie. Some, like the Border Collie, continue to share his name, while the Australian Cattle Dog and about a dozen others do not. To be clear, you should take any reference here to a “Collie” to mean either a Rough Collie or a Smooth Collie. The only significant difference between the two is their fur. 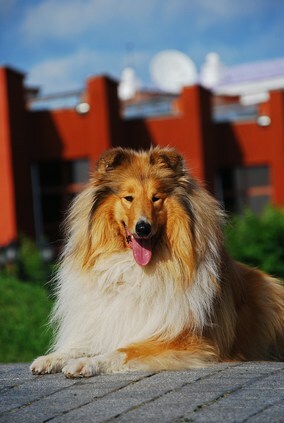 Else, there is no difference between a Rough Collie temperament and a Smooth Collie temperament. If you want to bring a Collie home the following temperament and personality traits will help you decide if this breed is a good fit for you. Collies are highly intelligent and very trainable. Housetraining is generally easy with a Collie. If you are into agility and obedience training, then you will find your Collie to be extremely responsive. Their intelligence, however, means that you must vary up their training regime to keep it challenging and fun. This is not a mindless dog who is going to feel satisfied doing repetitive tasks all day. The Collie’s intelligence also demands regular doses of mental stimulation. If his home is a farmhouse surrounded by a border of forests, then daily walks on different paths are probably going to be enough. However, a Collie who has his home in a typical suburb will require a little more effort on your part. Check out “Ten Fun Ways to Mentally Stimulate Your Dog” to get some good ideas. The Collie could very well be the most sensitive breed on the planet. Along with their sensitivity, they have a strong desire to please, which is probably why they do very well at dog shows. But the Collie temperament also allows him to quickly pick up on human tensions in the home. And, all too often, such tensions manifest as physical ailments. Some owners have noticed their Collie’s digestive systems going awry following a dust-up between family members. Other owners caution that negative feedback to a Collie — angry words, for instance — could send him into lower spirits for days. Possibly because of the sensitive Collie temperament, a Collie can easily become shy of strangers and, as a result, excessively reliant on your family’s company. Frequent socialization during his first year is therefore particularly important. Since part of his socialization occurs under a breeder’s care, make sure that you delve into his breeder’s history before committing to the purchase. It also isn’t a bad idea to investigate the personality of his parents either, since genetics certainly play a significant role in the Collie temperament. Even if the shepherding instinct is somewhat dormant in a modern-day Collie, it will come to the forefront from time to time. This isn’t necessarily a bad thing, except that it often comes along with the tendency to nip. It is imperative that you teach your Collie “bite inhibition” as a puppy. It's cute when he's little, but you don't want a full-grown adult nipping at your heels – ouch! The Collie is a medium-sized dog, weighing in at around 50-60 lbs., and with a shoulder height of about 24 inches. Surprising for a herding breed, the Collie seems to do fine with moderate exercise. A daily 30 to 60-minute walk with some degree of variety thrown in appears to satisfy most Collies. Add in a little intensity on the weekends, and most Collies are in their happy place. No discussion about the Collie would be complete without highlighting the fact that the majority — about 60 percent as per some reports — of Collies are missing both copies of the MDR1 gene. This makes them vulnerable to a number of conditions, the most important being their inability to deal with certain day-to-day drugs. To be clear, these drugs can kill them! Most veterinarians are likely to be fully aware of this, but it does no harm to confirm. You can put your mind at ease by getting your Collie tested to see which drugs he is more sensitive to. Some testing companies even issue certificates along with a list of drugs that you, as his owner, should avoid. 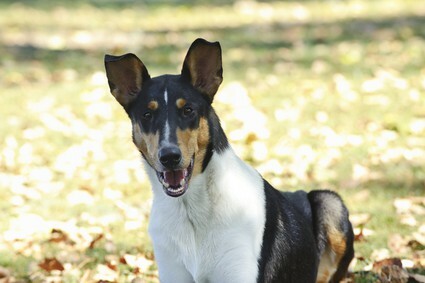 There is a move to breed this defect out of Collies, but such a process is a slow and painstaking one, requiring a lot of coordination and cooperation. Some estimates suggest that it would take a minimum of 30 years to implement this change. The Collie's life expectancy is between 14 and 16 years, which is pretty lengthy for a medium-sized dog. Smooth Collies do not have to worry about matting. They do require regular grooming, though, as they have a double coat. You must brush him out during his shedding seasons. Rough Collies, on the other hand, have a tendency to mat, especially behind their ears and elbows. You must brush him weekly to remove the dead hair and prevent his skin from developing an infection. Whether you spay or neuter your Collie makes a difference with regard to how he or she sheds. Spayed females have one big shed once a year, while intact females shed three months after their heat cycles. Males tend to shed around their birthdays, so pay attention to when he was born to know when to expect a huge shedding period! So you've decided that you'd like to bring a Collie puppy into your home. Fabulous! You can find a Collie for sale through a Collie breeder. You can also adopt or rescue one, if available, from your local animal shelter. Collies are not easy to find though, so you may have to do some digging to find a purebred. However, there tend to be more mixed breeds that include Collies, so if you’re fine with owning a “mutt,” then you may have better luck. Just be sure you become familiar with the temperament of the other dog that makes up his mix. The average price for a Collie puppy is between $400 and $600. However, the price can change wildly, depending on whether the dog's parents are of show quality and if the breeder simply decides to charge more. For instance, in some areas, Collies are rarer, such as on the east coast. So the price breeders in these areas decide to charge lean toward the higher end. If you're interested in buying a Collie, you may be able to find a Collie breeder in your local area. However, you should do your research before simply going with the first breeder you find. For one thing, you should always make sure you are buying a Collie and not a Sheltie, as the two dogs look incredibly similar at first glance. One way to know for sure is that Shelties are smaller than Collies; in fact, you could consider a Sheltie a miniature version of a Collie. As far as the breeder goes, in this digital age, we live in, there are plenty of ways to scope out a breeder before you even go to their house. Check out some lists of breeders, then Google the ones who are local to your area. Chances are, if someone is a bad breeder, there’ll be bad reviews online to reflect that. If you want to adopt a Collie puppy, you may be able to find one through your local rescue organization, but the odds of finding a purebred are highly unlikely. Just the same, keep checking back if you're unsuccessful on the first go-round because you just never know. You may decide to adopt if you find that a purebred dog is simply way too far out of your price range. Adoption may also be a more appealing option if you simply don't want to have to train a dog everything he needs to know. Dogs who are up for adoption are usually older, and so their former owners have probably already given them the basics as far as training goes. If not, the shelter will typically train the dog to help him be better prepared for family life (and therefore more adoptable). Another positive of adoption is that you are giving an older dog a loving home, and a warmer and more comfortable place to live than the cold shelter. More people want puppies than older dogs, and as a result, many older dogs live in shelters for years. Consider bringing home a shelter dog instead, and help one more dog find a loving home who might otherwise never find one. The Collie temperament makes him a wonderful choice for a family dog. While some traits are endearing, like how he is sensitive and easy to train, there are some behaviors you may not be a fan of. One of these is his tendency to become clingy. And if you love being able to show off a beautiful dog to those who come visiting, the Collie is definitely a good choice. The Rough Collie’s luscious fur goes on for days. Just be sure to take proper care of his coat to prevent matting and skin infections from dead hair blocking his pores’ ability to breathe.